The high-stakes, high-accountability world of expedition delivery allows no margin for error. When systems fail in the wilderness or on the road, the results can be fatal. Therefore, competent adventure-based organizations provide in-depth training to combat one primary key variable: human error. At Functional Adventure Corporate, our unique approach drills down to the core competencies of your human capital and the actual, quantified risk exposure of the enterprise to design objective, measurable strategies to close the deficit between those risks and the collective competency necessary to manage them. Your company's products and services depend on people more than process. We don't focus as much on acute risks but rather on isolating and defining sub-acute factors: the drivers of human behavior, professional judgment and decision making, and position-specific performance factors. These factors directly impact your team's engagement, motivation, and your risk exposure. At Functional Adventure Corporate, our philosophy is to focus on prevention of potentially negatively impactful events and poor staff culture. The vast majority of negatively impactful events in the workplace are preventable with early recognition and mitigation of key sub-acute root causal factors. Our approach is unbiased, objective and solutions-oriented. No motivational speaking. no group yoga. no team-building games. just data, agnostic modeling, a proven strategy and real results. When processes breakdown, corporate leaders must respond in costly, often time-consuming ways to reorganize departments and replace staff. Our approach is customizable to your company's industry, size and unique challenges. We won't try to pigeonhole your business into a one-size-fits-all strategy or sell you on one proprietary concept to boost our brand. We design an actual expedition of appropriate scope, objective and location for a higher level of training and assessment. This stage provides much greater scrutiny of your team and allows us to observe the key behaviors from Stage I training. Why is Stage 2 so important? 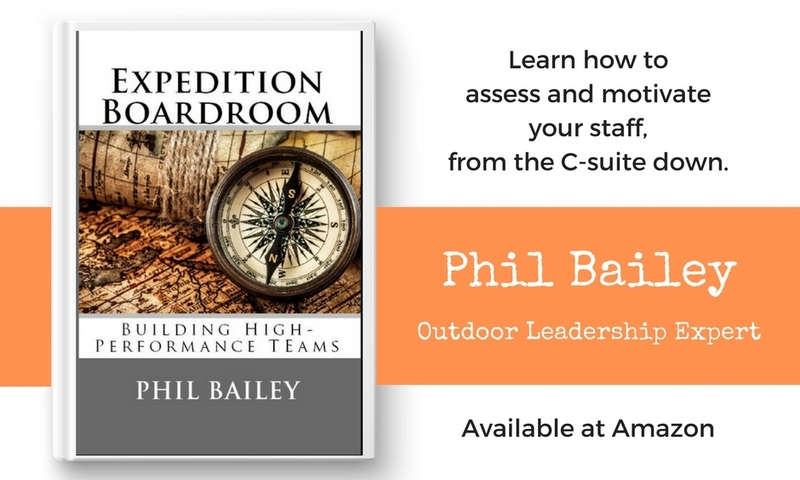 Written by Founder and Corporate Director Phil Bailey, EXPEDITION BOARDROOM is the result of decades of successes and failures leading expeditions and training expedition instructors and guides. This formative experience was followed by years of consultation with colleges to develop leadership programs and with outdoor industry providers to train field staff, create policy, provide safety audits and incident reviews, and to design programs and risk management strategies.